Our client’s love of music and film was the design inspiration for this New York pre-War apartment. The public rooms and their elegantperiod detailing were restored to their original fine quality. 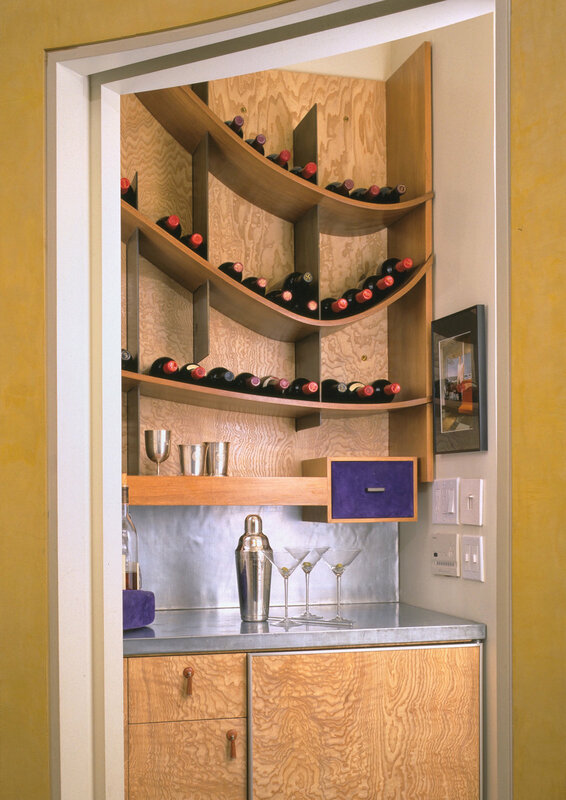 The walls conceal state of the art audio and video systems while a library and screening space was incorporated into custom cabinetry of red stained birds eye maple and wrought bronze. The oval gallery, plastered in plastered in polished ocher Venetian stucco, becomes the formal centerpiece of the apartment and organizer for the rooms around its perimeter. A white domed ceiling is ringed by concealed lighting and zink lined niches reflect the romantic amber glow of candle light. The bar, tucked behind the oval is sheathed in exotic veneers and cobalt blue suede details. The master bath is lined in a custom pattern of Italian mosaic tile in blue and white and includes a steam room. A second bath reminds us of the 1920s when the building was built, and was restored using original fixtures and reclaimed porcelain tile work.